Bloom Time: D. June, E. July, F. August, G. September Flowering: Blooming Growth Rate: Fast growth rate Light requirements: Partial Sun and shade Plant Group: Shrub Plant Type: Deciduous Plant Zone: Zone 5, Zone 6, Zone 7, Zone 8, Zone 9 Size at Maturity: 3 - 6 ft Size at time of shipping; 6-12'' Ships Bare root. NEW! Hydrangea macrophylla Sister Theresa An older but outstanding garden selection. Healthy dark green leaves supporting paper white flowers make this a delicate looking medium sized plant. In the fall the flower heads become green tinted with red when ready to dry. Partial shade is needed to grow this slender stemmed beautiful plant. This beautiful plant makes a season-long spectacle in your garden. Hydrangeas once the plant of choice for flowering shrubs is now making a comeback with the younger generation. Hydrangeas continue to be among the showiest of summer and autumn flowering woody plants. They are shade tolerant and grow well on the shady side of a building or under trees. Planted as specimens, or massed together for stunning borders. The dried flower heads are often used in flower arrangements. 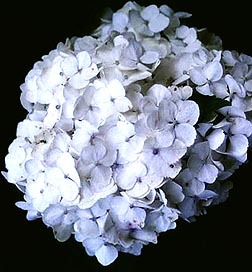 These hydrangeas are well-established, blooming-size.